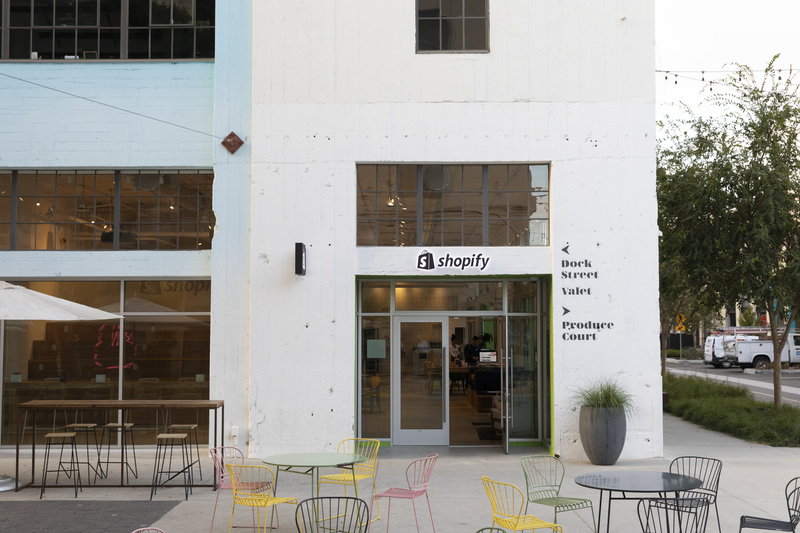 Shopify, the provider of payment and logistics management software and services for retailers, has opened its first physical storefront in Los Angeles. The first brick-and-mortar location for the Toronto-based company is nestled in a warren of downtown Los Angeles boutique shops in a complex known as the Row DTLA. For Shopify, Los Angeles is the ideal place to debut a physical storefront showing off the company’s new line of hardware products and the array of services it provides to businesses, ranging from newly opened startups to $900 million juggernauts like the Kylie Cosmetics brand. The city is one of the most dense conglomerations of Shopify customers, with more than 10,000 merchants using the company’s technologies in the greater Los Angeles area; 400 of those retailers have each earned over $1 million in gross merchandise volume. In the Los Angeles space, which looks similar to an Apple store, patrons can expect to see demonstrations and tutorials of how Shopify’s tools and features work. Showrooms displaying the work that Shopify does with some of its close partners will also show how business owners can turn their product visions into actual businesses. Like Apple, Shopify is staffing its store with experts on the platform who can walk new customers or would-be customers through whatever troubleshooting they may need, while also serving as a space to promote large and small vendors using its payment and supply management solution. Kanwar and Shopify chief operating officer Harley Finkelstein envision the new Los Angeles space as another way to support new and emerging retailers looking for tips on how to build their business in the best possible way.